Ugh, this week on PopMatters are use the C-word... Casual. Here's the thing. Casual game formats, where the core rules of a game get thrown out the window for a wacky combination of home brew rules, are incredibly conducive for luring people into an experience. This isn't some trick either. There's nothing deceptive about suggesting someone new to Magic that they should try Commander or Two-Headed Giant. These rule sets by themselves are incredibly entertaining, but more than that, they reveal the flexibility of the core game system. 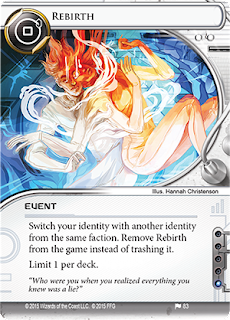 I love Netrunner, it's just not very flexible. I can't, say, mix things up by putting agendas in the runner deck. Or maybe I can, but I at least can't imagine how that could work. There is a possibility that a great set of home brew rules for Netrunner is just waiting to happen, but I suspect the limitation is in the game itself. Now this doesn't mean there isn't room for wackiness in Netrunner. Indeed, maybe a card like Rebirth is Fantasy Flight's attempt at mixing things up. I'm certainly excited to see what such disruptive cards can do to the game. Still, that layer of complexity is the exact opposite of approachable. Magic has been around for so long, and the card pool is immense and bloated, its community not nearly as welcoming, but I still find it easier to explain and share the joy of Magic than I do Netrunner.